The sound of Pink Floyd's lead guitar sits on top of the Orb's music rather than inside of it. That's good, but not good enough. When you think about it long enough, a collaboration between the Orb and David Gilmour seems natural. If Pink Floyd was the band that found a hidden door that sucked hippies in on one side and spit astronauts out the other, then Alex Paterson has been out on regular space walks since 1991. Their objectives in music lie on a similar plane, though they approach them from different angles. Armed with a lap steel or a Fender Strat and buoyed by the keys of the late Richard Wright, Gilmour rolled his sounds around in outer space again and again until he stumbled upon a sweet spot. Paterson and a rotating cast of colleagues have made a career as dub garbage pickers, constructing and dismantling sound collages made of samples, beats, and just about any miscellaneous random noise they could grab. The best of both the Floyd and Orb worlds offers up music that doesn't sound earthbound, and a combination of the two could be a great double wormhole just waiting to hypnotize listeners. 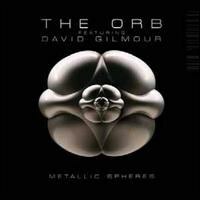 Unfortunately, the Orb and Gilmour collaboration Metallic Spheres spends more time searching for an anchor than it does breaking through into transcendence. The album plots its course over two tracks in 49 minutes, leaving lots of room for the slow-changing ebb and flow that the Orb like to use. The issue of time use wouldn't be a big deal if a majority of it wasn't spent fishing. Gilmour's lines, especially the ones from the lap steel, just sort of sprawl all over the scale hoping to find an idea that will stick. The elements thrown down by Paterson and producer Martin "Youth" Glover, though lacking ambition and variance, are a customarily welcome presence. The shifts in movement (five to a side) are as subtle as Orb tradition dictates, completely blurring the end of track one and the start of track two. But when a world famous guest guitarist sounds like another superimposed sample that was bloodlessly grafted into the big picture, it gives you a case of the what-could-have-beens. The ending of Metallic Spheres is far more glorious than the vamping that precedes it. Track one, "Metallic Side", is the longer of the two, but it's the second one, "Spheres Side", that comes closest to discovering trance magic. The closing half of the track comes into a full bloom that can't really be accurately described as clubby or trance or space-rock. This is a part of the album that doesn't concern itself with dance elements, and Metallic Spheres is all the better for it. It's simply a synthesizer as big as all outdoors, if you can believe that -- as big as the English countryside, as grand as Terrence Malick cinematography. These realizations belong more to the Orb than Gilmour, reducing the mighty guitarist behind the solos of "Time" and "Money" to just being a provider of nifty little afterthoughts. As is the case with many big league collaborations, it doesn't feel like either party brought their best game to the project. As an Orb album, Metallic Spheres is satisfactory. For Floyd and Gilmour fans, it's a rainy day curiosity. With age, ambition certainly has a tendency to fade. If Alex Paterson and David Gilmour have made some of the most successful celestial music around, this new collaboration is steeped more like Celestial Seasonings Herbal Tea: it's palatable, but it won't make you want to run into the street to stop traffic. Well, maybe the final ten minutes of it.